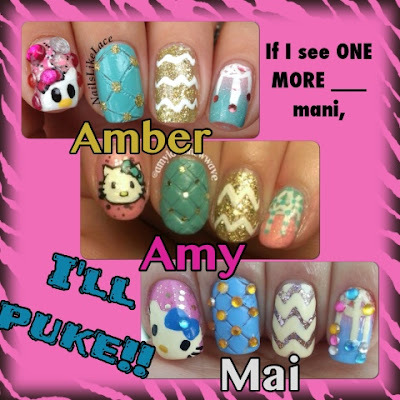 NailsLikeLace: If I See One More ____ Mani, I'll Puke! Have I mentioned that I love doing collabs?! Well, I do. And of course, I've done a gazillion more! A while back, I did a collab with a few other girls were we did designs that aren't necessarily bad or ugly, but are overdone. So in another collab I did recently on IG with Amy and Mai, we repeated that same theme, for a second version. This time, our "overdone manis" were Hello Kitty, the quilted technique (btw, if you can accomplish it, I give you kudos because it is a PAIN! ), chevrons, and the half moon dream catcher (they can be really gorgeous, but again, PITA!). In my mani, that poor excuse for a Hello Kitty is on a base of Color Club Sugar Sheer and Lush Lacquer Pink Panther. 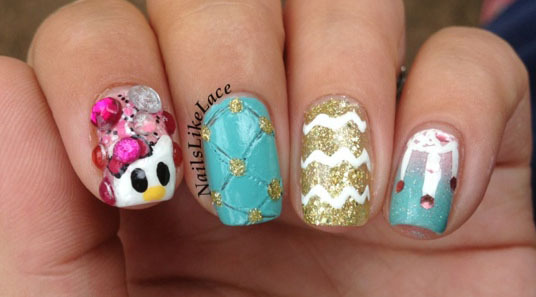 My quilted nail is China Glaze For Audrey with dots of Blonde Bombshell. My chevron base is Blonde Bombshell, and my pinky gradient is Sugar Sheer and For Audrey (topped with Fairy Dust, of course, because that is also ridiculously overdone)!